^ Clayton Roberts, David Roberts著，賈士蘅 譯：《英國史》，p. 552. ^ 保羅·甘迺迪 著，陳景彪 等 譯：《大國的興衰》，第一編第三章. ^ 5.0 5.1 （英）温斯顿·丘吉尔 著，薛力敏、林林 譯：《英语国家史略》，第三卷第六章. ^ 6.00 6.01 6.02 6.03 6.04 6.05 6.06 6.07 6.08 6.09 6.10 6.11 6.12 6.13 6.14 6.15 6.16 6.17 6.18 6.19 6.20 6.21 6.22 6.23 6.24 6.25 6.26 6.27 6.28 6.29 6.30 Curtis, Gila. 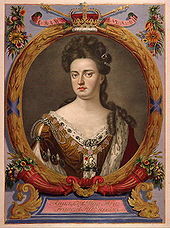 The Life and Times of Queen Anne. London: Weidenfeld & Nicolson. 1972. ISBN 0-297-99571-5. ^ 7.00 7.01 7.02 7.03 7.04 7.05 7.06 7.07 7.08 7.09 7.10 7.11 7.12 7.13 7.14 7.15 7.16 7.17 7.18 7.19 7.20 7.21 7.22 7.23 7.24 7.25 7.26 7.27 7.28 7.29 7.30 7.31 7.32 7.33 7.34 7.35 7.36 7.37 7.38 7.39 7.40 7.41 7.42 7.43 7.44 7.45 7.46 7.47 7.48 7.49 7.50 7.51 7.52 7.53 7.54 7.55 7.56 7.57 7.58 7.59 7.60 7.61 7.62 7.63 7.64 7.65 7.66 7.67 7.68 7.69 7.70 7.71 7.72 7.73 Gregg, Edward. Queen Anne. New Haven and London: Yale University Press. 2001. ISBN 0-300-09024-2. ^ 8.00 8.01 8.02 8.03 8.04 8.05 8.06 8.07 8.08 8.09 8.10 8.11 8.12 8.13 8.14 8.15 8.16 8.17 8.18 8.19 8.20 8.21 8.22 8.23 8.24 8.25 8.26 8.27 8.28 8.29 8.30 8.31 8.32 8.33 8.34 8.35 8.36 8.37 8.38 8.39 8.40 8.41 8.42 8.43 8.44 8.45 8.46 8.47 8.48 8.49 8.50 8.51 8.52 8.53 Green, David. Queen Anne. London: Collins. 1970. ISBN 0-00-211693-6. ^ 9.00 9.01 9.02 9.03 9.04 9.05 9.06 9.07 9.08 9.09 9.10 9.11 Waller, Maureen. Sovereign Ladies: The Six Reigning Queens of England. London: John Murray. 2006. ISBN 0-7195-6628-2. ^ 10.00 10.01 10.02 10.03 10.04 10.05 10.06 10.07 10.08 10.09 10.10 10.11 10.12 10.13 10.14 10.15 10.16 10.17 10.18 10.19 10.20 10.21 10.22 10.23 10.24 10.25 10.26 10.27 10.28 10.29 10.30 10.31 10.32 10.33 10.34 10.35 10.36 10.37 10.38 10.39 10.40 10.41 10.42 10.43 10.44 10.45 10.46 10.47 10.48 10.49 Somerset, Anne. 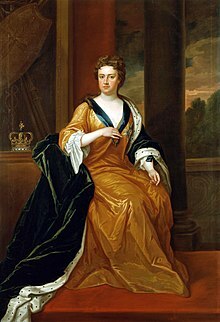 Queen Anne: The Politics of Passion. London: HarperCollins. 2012. ISBN 978-0-00-720376-5. ^ 11.0 11.1 Weir, Alison. Britain's Royal Families: The Complete Genealogy, Revised Edition. London: Random House. 1995. ISBN 0-7126-7448-9. ^ 25.0 25.1 25.2 Yorke, Philip Chesney. Anne (1665–1714). Encyclopædia Britannica 11th. Cambridge: University Press. 1911. ^ Negotiations for Union 1702–03. UK Parliament. [9 March 2013]. ^ Clerk's memoirs, quoted in Gregg, p. 240 and Somerset, pp. 316–317. ^ 92.0 92.1 Kendall, K. Limakatso. Finding the Good Parts: Sexuality in Women's Tragedies in the Time of Queen Anne. (编) Schofield, Mary Anne; Macheski, Cecilia. Curtain Calls: British and American women and the theater. Athens, OH: Ohio University Press. 1991. ISBN 0-8214-0957-3. ^ Traub, Valerie. The Renaissance of Lesbianism in Early Modern England. Cambridge, England: Cambridge University Press. 2002. ISBN 0-521-44427-6. ^ No. 5254. London Gazette. 24 August 1714: 1. ^ Quick Guide: Act of Union. BBC. 15 January 2007 [26 March 2013]. ^ No. 1065. London Gazette. 31 January 1675: 2. No. 1143. London Gazette. 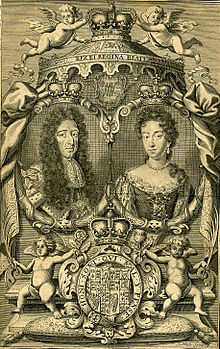 30 October 1676: 1. ^ No. 2361. London Gazette. 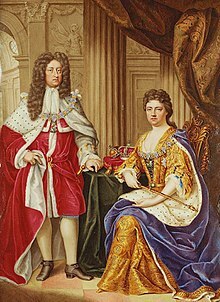 5 July 1688: 1. No. 2365. London Gazette. 19 July 1688: 2. ^ Wallis, John Eyre Winstanley. English Regnal Years and Titles: Hand-lists, Easter dates, etc. London: Society for the Promotion of Christian Knowledge. 1921: 62–63. 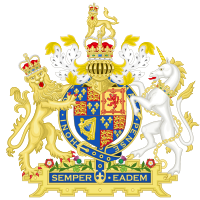 ^ Union with England Act 1707: Section I. The National Archives. [26 March 2013]. ^ Union with England Act 1707: Section XXIV. The National Archives. [26 March 2013]. ^ No. 2216. London Gazette. 10–14 February 1686: 2. ^ 142.0 142.1 Ward, Adolphus William. Anne (1665–1714). (編) Stephen, Leslie. Dictionary of National Biography. London: Smith, Elder & Co. 441–474. 1885. ^ No. 2214. London Gazette. 3–7 February 1686: 2. Curtis, Gila; introduced by Antonia Fraser (1972). 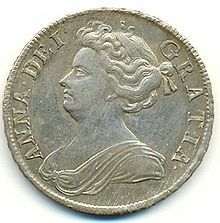 The Life and Times of Queen Anne. London: Weidenfeld & Nicolson. ISBN 978-0-297-99571-5. Green, David (1970). Queen Anne. London: Collins. ISBN 978-0-00-211693-0. Gregg, Edward (2001). Queen Anne. New Haven and London: Yale University Press. ISBN 978-0-300-09024-6. Kendall, K. Limakatso (1991). Finding the Good Parts: Sexuality in Women's Tragedies in the Time of Queen Anne. In: Schofield, Mary Anne; Macheski, Cecilia (eds). Curtain Calls: British and American Women and the Theatre, 1660–1820. Athens: Ohio University Press. ISBN 978-0-8214-0957-2. Nenner, Howard (1998). The Right to be King: the Succession to the Crown of England, 1603–1714. Basingstoke, Hampshire: Palgrave Macmillan. ISBN 978-0-333-57724-0. Pinches, John Harvey; Pinches, Rosemary (1974). The Royal Heraldry of England. Heraldry Today. Slough, Buckinghamshire: Hollen Street Press. ISBN 978-0-900455-25-4. Traub, Valerie (2002). The Renaissance of Lesbianism in Early Modern England. Cambridge: University Press. ISBN 978-0-521-44427-9. Weir, Alison (1995). Britain's Royal Families: The Complete Genealogy, Revised Edition. London: Random House. ISBN 978-0-7126-7448-5.